Windscreen shades, keep that sun out! 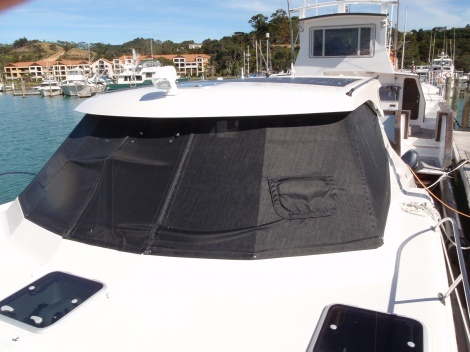 Custom fitted Solartex 90% sunblock window shades on your cruising cat, powercat or launch reduces the damaging effects of UV on the interior furnishings and keeps the interior temperature down too! Designed in modular fashion so you can remove the front panel for visibility while underway yet leave the side panels on for added privacy and sun protection. Our window shades are a standard item on every Prowler powercat manufactured by Formula Boats.